I was very happy to see that the Madre Cacao cuttings which was given to us by a friend from Batangas has already thrived and looks healthy. 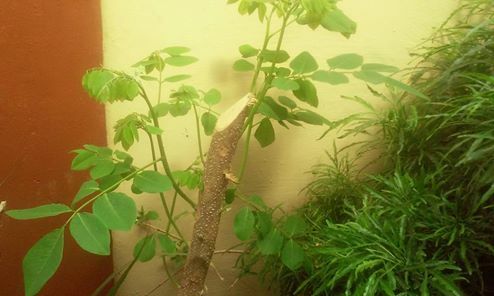 It was just a stick when we planted it into a pot. At first, I was not expecting that it will survive since we've just planted it in a pot. However, I was told that trees that are actually planted on plastic containers or pots will be dwarfed since it doesn't have enough space to grow it's roots, nonetheless these will survive as long as they receive the proper care like enough supply of water and sunlight. My idea of growing our own Madre Cacao tree is because of our fur baby Marcus who always get skin problems like Mange. Sometimes, he feels very itchy and would scratch his body until wounds developed. We've been bringing him to his Vet for proper treatment but the Mange keeps on coming back. Getting rid of dog mange is not so easy and is also very costly, so we have resorted to using herbal treatment for our little Marcus. We were told that boiling Madre Cacao leaves and using it as a rinse for the dog during bath time will help to heal the wounds caused by Mange. You have to let the Madre Cacao rinse dries on the dog's body. The treatment doesn't seemed to be so easy You need enough patience and time. My son has been giving Marcus a Madre Cacao bath for nearly 2 months before we can see that his condition is improving. Now, he is totally Mange free and his fur that sheds off during the treatment period has grown back. I was lucky that my son is here to look after Marcus and bathe him regularly, it's not an easy task you know. We need to change his shirts and beddings almost everyday and that's an extra thing to do, but the best part of it was that Marcus is safe from side effects that oral medicines and injections might do to his body, not to mention that we were able to save a lot from the Vet professional fees and other medicines. I hope that we could maintain our fur baby Marcus free from Mange as this is his problem since he was small. Sometimes, that's the wonder of nature, what you think is useless is actually the one which could solve your problem.